Many African American will be celebrating the religious holiday of Easter this weekend. It is interesting that many of us only think about the buying of new clothes associated with this spring festival. The buying of new clothes for Easter is tantamount to Santa Claus bringing toys to kids for Christmas. It holds no religious significance. It always befuddles me to see that, the poorest people are so focused into the economically exploitative rituals and ignorant of actual traditions. In my life experiences I have never heard Caucasians discuss getting new clothes for Easter. Maybe this is a "Black Thang" ? We are a very creative and stylish people so I would not be surprised to learn that this century long fad is exclusive to African-Americans. There are a lot of Black people who will go out and make Ralph Lauren (Polo) and Tommy Hilfiger richer this Easter. Tommy Hilfiger has already recognized that a sizable portion of our community "find esteem" through his clothing. In a recent interview in Forbes Magazine Hilfiger talked about those type of individuals he said "many of these people would rather have a Rolex than a house"… unfortunately he's telling the truth. I don't want to appear to be a party pooper so let me move from the contemporary role of Black people and Easter and look at the ancient role of Black people and Easter. Many of us are not aware of the reform and modification that Easter had to go under before it became what we know it as now. This is due to the influence of an African Pope named Victor I. In the history of the Catholic Church there have been four Black Popes, three were pure Africans and one was mixed of African and European parents. This of course would classify him as Black according to the hypodescent laws we observe and his genetic phenotype. The names of these four Popes are Victor I, Melchiades, Gelasius I and Adrian. Melchiades is the most famous for bringing Christianity to its final triumph against the Roman Empire. 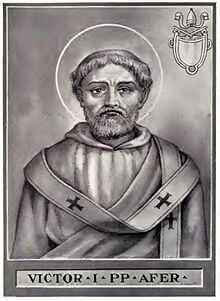 However let us turn our attention to Victor I.
Victor ascended the Papal Chair in 189 AD. During this time the date of Easter continued to be a matter of controversy. Many of the Christians of Rome who had come from the province of Asia were accustomed to observe Easter on the 14th day of the moon. That was the day on which the Jews had been commanded to kill the lamb. It was viewed as necessary to finish the feast on that day, whatever day of the week it might be. Instead of recognizing Good Friday as the day of the Lords death, the Asiatic Christians kept the the Jewish feast on the 14th day after the new moon, with which the month Nisan began. Victor I found it disturbing to have one set of Christians observing the fast of lent and commemorating Christ's passion while other Christians were joyously celebrating the feast of resurrection. Victor was determined to put a stop to this and to bring about unity in observance of the Easter Festival. With that in view he set about persuading the Asiatic Christians (who by the way were called Quartodecimans) to join in the general practice of the church. Victor ordered Polycrates to hold a council of Asiatic Bishops and get them to follow the Western custom. Their decision was addressed to Victor and the Church of Rome by Polycrates. Next Victor called a meeting of Italian Bishops in Rome. (This is earliest synod on record) He also wrote to the leading Bishops of the various districts, urging them to call together the Bishops of their sections of the country and to take counsel with them on the question of the Easter Festival. Letters and responses came in from all congregations and individual Bishops. These letters all reported that Easter was observed on a Sunday. At this point Victor now called for the Asiatic Christians to abandon their old custom and accept the majority ruling to celebrate Easter on Sunday. Failure to abide would result in excommunicating all the Christians of Asia. This harsh ruling did meet with some resistance. It wasn't until the middle of the third century that his ruling became universal. Unfortunately he did not live to see his ruling become universal. Victor died in 199 AD. and was buried in the Vatican near St.Peter. Today in the history of the Roman Church he is remembered for his Easter ruling and he is named in the canon of the Ambrosian Mass, he is also said to have been the first in Rome to celebrate the Holy Mysteries in Latin. A 30 minute feature called African Popes was broadcast by the British Broadcasting System and details more of Victor I accomplishments. More recently African Presence in Early Europe compiled by Ivan Van Sertima and The Saints go Marching In by Robert Fulton Holtzclaw (Keeble Press 1980) would be good books to buy instead of a Easter outfit but I will stop here because recommending a good book for a kid over a Easter outfit could get me in serious trouble.